Embodiments of the present invention present a method and apparatus for photonic line sharing for high-speed routers. Photonic switches receive high-speed optical data streams and produce the data streams to a router operating according to routing logic and produce optical data streams according to destination addresses stored in the data packets. Each photonic switch can be configured as one of a 1:N multiplexer or an M:N cross-connect switch. In one embodiment, optical data is converted to electrical data prior to routing, while an alternate embodiment routes only optical data. Another embodiment transfers large volumes of high-speed data through an optical bypass line in a circuit switched network to bypass the switch fabric thereby routing the data packets directly to the destination. An edge device selects one of the packet switched network or the circuit switched network. The bypass resources are released when the large volume of high-speed data is transferred. The present invention relates to data packet networks and, more particularly, the present invention relates to high-speed routing of data packets in the data packet network. Communication service providers, as well as network service providers, face some difficult challenges as the various networks are increasingly modified to work together to provide seamless end-to-end connectivity across the various platforms and protocols. Ever-increasing residential dial-up subscribers and broadband subscribers demand increasing network speed. To meet this demand, network service providers are deploying a large number of complex, port-dense Network Access Servers (NAS) to handle thousands of individual dial-up connections. As such, small and large, as well as private and public, data packet networks are being created to enable users to establish point-to-point connections independent of terminal type and location. Traditional circuit switched voice networks have paved the way for the creation of data packet networks as users loaded the voice networks trying to transmit data, including streaming data (video and voice). Initially, traditional Public Switched Telephone Networks (PSTNs) were used for data transmissions but have been largely supplanted by data packet networks, including various versions of the “Internet” for purposes of data transport. During the Internet boom, fiber optic cable was installed to meet the increasing demand for high-speed access to the data packet network. With fiber optic cable, optical networks have been developed in various forms utilizing various transport technologies. For example, dense wavelength division multiplexing (DWDM) is being used in optical networks to significantly increase throughput and, more generally, to transport data from point to point. High-speed transceivers up to OC-192 (Optical Carrier, 9.6 gigabits-per-second) have been installed to meet the increasing demand. The expectation being that the high cost of installing and maintaining a high-speed network will be recovered as more users demand more bandwidth. The Internet business climate is changing and demands are being put on operators to provide bandwidth while optimizing the use of their networks to reduce the operating costs. Network operators and network service providers thus need a more economical method to use the expensive resources. Bandwidth is not only a concern to individuals, but also to service providers. From the operator’s perspective, bandwidth is the key to the number of users a communication system can support at any given time, the amount of data that can be transported via the communication system at any given time, and the speed at which the data can be transported. Bandwidth thus translates into a number of potential customers and revenue. For this reason, companies spend billions of dollars annually to develop equipment to increase the bandwidth of communication systems, such as the Public Switched Telephone Network (PSTN), wireless communication systems, wire line communication systems, and/or the Internet. One key standard that increases the bandwidth of communication systems, is SONET (Synchronous Optical NETwork). SONET was created to provide a cost effective platform for multi-vendor internetworking and offers the advantages of back-to-back multiplexing, compatibility with other standards, and ultra high performance. In particular, SONET is a transmission technology, which resides in the physical layer and can be used to carry a wide variety of types of traffic, including ATM (Asynchronous Transfer Mode) cells. In addition, the SONET physical layer may be used in a wide variety of applications, including LAN-to-LAN interconnections, host-to-host interconnections, video conferencing, team engineering, distributed processing, and advanced scientific research. The basic building blocks of a SONET system are 125 microsecond frames that come in two sizes of Synchronous Transport Signal (STS) frames: the STS-1 frame and the STS-3 frame. The STS-1 frame provides a bit rate of 51.84 Mbps while the STS-3 frame provides a bit rate of 155.52 Mbps. Once an STS frame is converted from an electrical format into an optical format for transmission, the frame is then referred to as an Optical Carrier (OC), but still has the same bit rate as the STS frame. As mentioned, SONET is a transmission technology, which differs from switching technology. Switching technology is concerned with how data is routed across the network, while transmission technology is concerned with how data is encoded and transported across the network. SONET, therefore, separates the overhead of switching technology, such as ATM from the payload fields (i.e., the data). As such, SONET is not applied directly to the switching devices of a network, but is used to specify the interface between the switches that are linked by optical fibers. Thus, standard ATM or LAN switches are equipped with a SONET interface in order to comply with the SONET specification. As the demand for bandwidth escalates, various network elements are being made to receive and transmit optical data for increased performance. Optical equipment and transceivers, for use in network elements such as routers, however, are expensive. Because a router has many different ports, using an optical transceiver for each port results in the use of optical technology for routers being very expensive. What is needed, therefore, is a router with optical transceivers that is economically feasible. The method and apparatus of the present invention reduces the cost of operating and maintaining high-speed optical fiber networks by using scaleable photonic switches to selectively couple fiber lines to a shared optical transceiver port and optical router. The photonic switches share an optical transceiver input or output with multiple fiber lines thereby reducing the number of optical transceivers needed to service the multiple fiber lines. Unused or lightly used fiber lines may be reduced through the use of photonic switches to carry data packets. Moreover, dedicated backup fiber may be reduced as one backup fiber may be used to provide redundancy for multiple primary fibers. 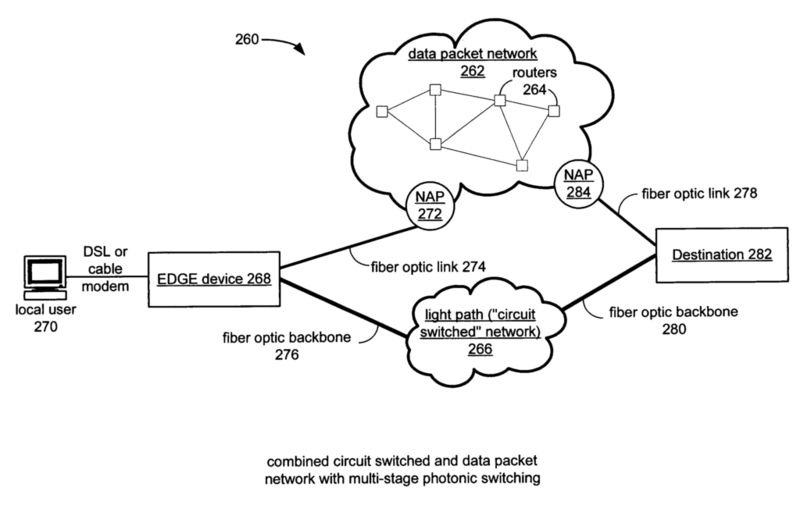 A routing system of the present invention comprises at least one high data rate input optical port that receives high data rate optical data and converts the optical data to electrical data, switch fabric coupled to receive the electrical data and to switch the electrical data to route the electrical data on a packet-by-packet basis to an output optical port, and at least one photonic switch coupled to a plurality of optical ports. A plurality of fiber lines are coupled to the input optical port and optical output port of the photonic switch to transmit the data packets from a source to a destination stored in the data packet header. Switch intelligence comprising one of a data packet routing system controller and routing logic evaluates the high data rate optical data to determine an efficient transport mechanism. The transfer of a small volume of data may be routed through the data packet network. The routing logic maintains a mapping table for each input and output photonic switch to optimize the routing of data packets based on the destination IP address. The switch intelligence transmits control commands to route the data packet through the input photonic switch and the output optical switch. In one embodiment, the optical data is converted to electrical data before routing through the data packet network. In another embodiment the data packet stays in the optical domain during the routing and switching process. Large data transfers are more efficiently transported through a dedicated optical path, or light path, using a mechanism similar to circuit switching in which a dedicated end-to-end optical path is established from the source to the destination. In one embodiment of the present invention, a large volume of data is circuit switched through an optical bypass line to bypass the packet switched circuits to reducing loading on the data packet network. The above-referenced description of the summary of the invention captures some, but not all, of the various aspects of the present invention. The claims are directed to some of the various other embodiments of the subject matter towards which the present invention is directed. In addition, other aspects, advantages and novel features of the invention will become apparent from the following detailed description of the invention when considered in conjunction with the accompanying drawings.